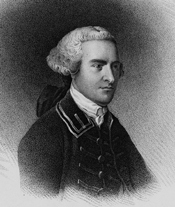 HANCOCK, John, a Delegate from Massachusetts; born in Quincy, Norfolk County, Mass., January 12, 1737; pursued classical studies; was graduated from Harvard College in 1754; a selectman of Boston several terms; member of the provincial legislature 1766-1772; president of the Provincial Congress in 1774; Member of the Continental Congress 1775-1778 and served as President of the Congress from May 24, 1775, to October 1777; first signer of the Declaration of Independence; served as senior major general of Massachusetts Militia during the Revolutionary War; member of the Massachusetts constitutional convention in 1780; Governor of Massachusetts 1780-1785; was again elected President of the Continental Congress on November 23, 1785, but resigned May 29, 1786, not having served on account of illness; again Governor of Massachusetts from 1787 until his death in Quincy, Mass., October 8, 1793; interment in Old Granary Burying Ground, Boston, Mass. Unger, Harlow G. John Hancock: Merchant King and American Patriot. New York: John Wiley & Sons, 2000.